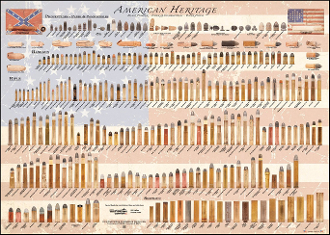 The American Heritage - Special Edition poster highlights black powder ammunition (Rifle, Shotgun, and Handgun) used by the American Rifleman and US Military from 1776 to roughly 1885 when the conversion was made to smokeless powder. It also includes flags from the civil war era in the background. It includes all versions of musket ball, paper and combustibles, and self contained black powder munitions that were used by the US military including Confederate and Union Civil War ammunition. This poster displays Sharps, Bullard, Ballard, Burnside, Peabody (What Cheer), Remington, Hepburn, Maynard, Stevens, Winchester, Spencer, Colt, Thuers, Mississippi Rifle, Snyder, Roper, Evans, Wesson, Smith & Wesson, Ward-Burton, Meigs, Dangerfield-LeFever, Schofield, and Roberts. The poster is 38" wide and 27" tall. It provides full color images of over 280 cartridges, paper and combustibles, or projectiles - all life size (within 4/1000 of an inch). Images are full color on High gloss / High quality 100lb poster paper.